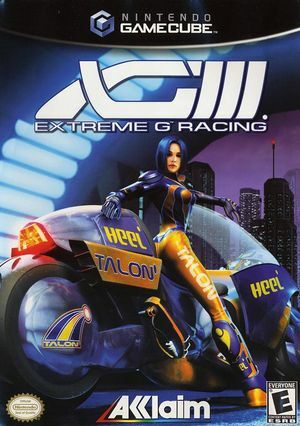 XG3: Extreme G Racing, or XGIII: Extreme G Racing, or more commonly known as Extreme-G 3, is a futuristic racing game for the Nintendo GameCube developed by Acclaim Cheltenham and published by Acclaim Entertainment. XG3 is a fast-paced futuristic/extreme racing game. Players start at the lowest and slowest classes at first, and use skilled racing and a wide variety of weapons and defensive items to climb up to higher classes. Unlike other games of its type, some simulator aspects are present in the game, like the presence of the sound barrier. Various decals in the game may not display correctly due to z-fighting issues. This can be addressed by disabling "Fast Depth Calculation". The graph below charts the compatibility with XG3: Extreme G Racing since Dolphin's 2.0 release, listing revisions only where a compatibility change occurred. 4.0-5003 Windows 7 Intel Core i7-920 NVIDIA GeForce GTX 660 Perfect, even with Frame Skipping on. Full speed on single player and 2 player split screen. 4.0-5287 Windows 7 Intel Core i7-4770K NVIDIA GeForce GTX 660 Ti Perfect, except Fast Depth Calculation needs to be off or the shield/ammo pickups and other decals such as the windows on buildings will exhibit z-fighting.